"To the memory of Trim, the best and most illustrious of his Race, – the most affectionate of friends, – faithful of servants, and best of creatures. He made the Tour of the Globe, and a voyage to Australia, which he circumnavigated; and was ever the delight and pleasure of his fellow voyagers. Returning to Europe in 1803, he was shipwrecked in the Great Equinoxial Ocean; This danger escaped, he sought refuge and assistance at the Isle of France, where he was made prisoner, contrary to the laws of Justice, of Humanity, and of French National Faith; and where, alas! he terminated his useful career, by an untimely death, being devoured by the Catophagi of that island. Many a time have I beheld his little merriments with delight, and his superior intelligence with surprise: Never will his like be seen again! 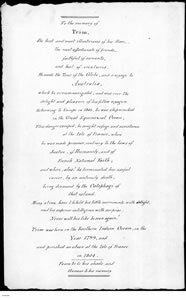 Trim was born in the Southern Indian Ocean, in the year 1799, and perished as above at the Isle of France in 1804. Peace be to his shade, and Honour to his memory." Image used by kind permission of Lisette Flinders Petrie.